This fall, experience the effects of fluid rainbows and a three-dimensional universe. 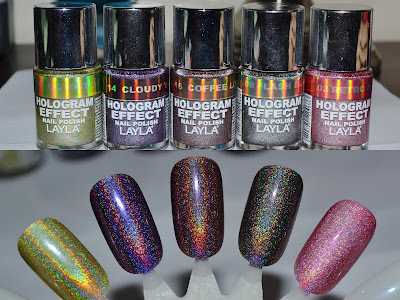 Layla Cosmetics introduces 8 new fall shades for the Hologram Effect nail polish in iridescent shades that are perfect for fall such! Delivering a 3-D result with incredible color and shine, Hologram Effect allows you to be your own nail artist. Swatches of 3 shades are below! First 3 swatches are some of the new Fall colors, the last two are holograms that are already available. L-R: Gold Idol, Cloudy Violet, Coffee Love, Black Flash, and Retro Pink. Hologram Effect’s fast drying, high coverage polish will last 2-4 week. The revolutionary formula will not stain the nail and is free of toluene, camphor, formaldehyde and DBP. Choose from 16 intense colors to produce holographic nail art at your fingertips: Gold Idol, Emerald Divine, Shock Pink, Red Taboo, Purple Illusion, Cloudy Violet, Misty Blush and Coffee Love. Layla Hologram Effect and Magneffect are available at Ulta Stores nationwide / Ulta.com / Zappos.com and retails for $15.50.